The 2015 MMMM starts today, Tuesday January 20, and once again features a mega-meta hidden in the 12 monthly puzzles. Since there’s a modicum of prestige associated with being among the first to crack it, I’d appreciate it if people could avoid comments speculating on what unusual puzzle features may/may not be related to the mega-meta. If you’d like to try the puzzles, you can sign up for free at pmxwords.com. 18a. [Dish with croutons and Parmesan cheese], CAESAR SALAD. You can leave out the anchovies and I won’t tell anyone. Sid Caesar. 24a. [Pull-down sleeper], MURPHY BED. Eddie Murphy. 37a. [Evian competitor], CRYSTAL GEYSER bottled water. Billy Crystal. 52a. [“Tommy,” for one], ROCK OPERA. Chris Rock. Also a filmmaker these days. Might’ve been nice to include a female comedian or two in the theme, but comedy’s been notoriously tough for women to make their way into, and you’d need women whose names lend themselves to the theme. Barr, Rudner, Poundstone, Silverman, Boosler, Bernhardt, Schumer … phrases don’t start with those. A few entries seemed a bit difficult for a Tuesday puzzle. Spanish MES and French ETES, old-timey PHIAL, unfamiliar-outside-crosswords MOC, ELD, composer LEHAR (if you don’t know his L and you don’t know that [__ canto] clues BEL, you’re out of luck here), violinist Leopold AUER, 15a. [Ivanhoe’s love] ROWENA, and Hermann HESSE (though I did read Siddhartha in high school English). The ELI clue (69a. [Old ___ (Yale, affectionately)]) is also targeted at either folks who went to Yale or folks who know their crosswordese. However! DONG is probably familiar to everyone who’s been through seventh grade. 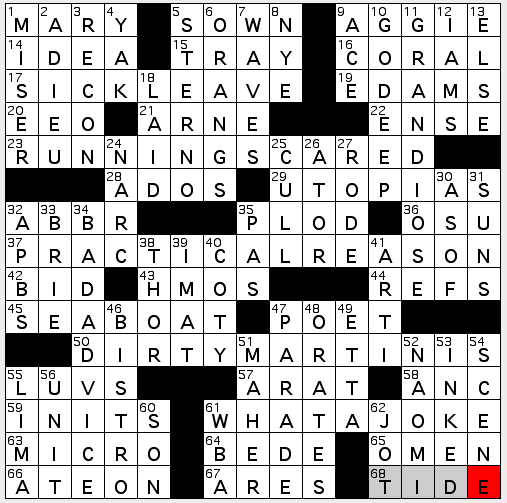 (Not with that clue, though—26d. [Bell sound]). CRAB BALLS yesterday, DONG today. What will tomorrow bring? I did like MALAMUTE, CAMEROON, RASHOMON, and the PAJAMA EXODUS a lot—nice sparkle there. It’s wide-open themeless time at the Jonesin’ Ranch! A 64-worder with big, fat wedges of white space and long stacks, unusual grid design. There are tradeoffs, with some really juicy stuff I loved offset by the inevitable compromises. First up, the goodies: VISUAL AIDS are solid. “WHAT THE…” is something I say and enjoy. AESTHETES, full of common letters but with a fancy touch. MUDGUARD, keep on truckin’. “I ALONE,” that sort of mournfully angry-sounding Live song. FOREIGNER, whose “Hot Blooded” I was just parodying this afternoon when my mom recounted a time when I had a fever of a hundred and three. JIMMY FALLON, that annoying name that you can’t fill in the last 6 letters without some crossings when the clue is vaguely late-nightish. FUDGE RIPPLE ice cream. UNWEIGHTED grades, as I was just chatting about weighted GPAs on Facebook yesterday. LATTE ART, drawn in the milk foam. NELL CARTER, full name. GRAPE TOMATO, sweet and juicy. In the debit column, we have contrived BALDIE. Obscure NEVO, 25a. [London music producer Yoad ___ (reverses to something in the kitchen)]. Plural abbrev LLPS. 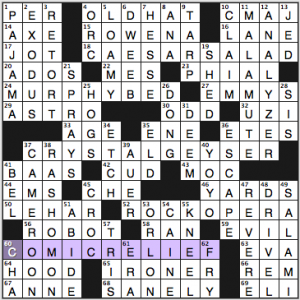 Contrived “I’M ALL READY.” Two titles (34a, 54a) with stranded […, with “The”] clues. Unfamiliar FITB plural ELSIES. Unfamiliar 46d. [Lord ___ Baratheon (“Game of Thrones” character) (anagram of ROSY)], ORYS. Contrived ADIPOSENESS (adiposity is more likely). Okay, so the count is 12 things I adored, 9 things I loathed, and 43 entries that were fine, but no great shakes. Let’s call it 3.6 stars, pulled down a lot by the nasty 9. 23A. [In a panic] RUNNING SCARED → running joke. Not jokes about jogging, but a repeated joke—or gag—that (when well made) will make you laugh/amuse you more with each iteration. In I Love Lucy, for example, the trope of Lucy’s foiled attempts to find employment is a running joke, one that ran though the entire series, in fact, in such classics as “Vitameatavegamin” and the “Italian Movie” grape-stomping and Lucy in the candy factory. 37A. [Subject of an Immanuel Kant critique] PRACTICAL REASON → practical joke. First of all, Kant? Terrific. Heady! Practical joke? Well, that’s a prank or some trick played on someone else—at that person’s expense. Low-level: short-sheeting a bed; more elaborate ideas here. We also get (what I see as ) a bonus themer by way of BAD ADVICE [“Buy high, sell low,” for example] and the idea of a bad joke. That “advice,” for one; or my “dirty” joke, or any joke that doesn’t land. Or, to some, puns. And/or punny clues… [“Cheesy” region of France] for BRIE or [Course offered in a drawing room?] for ART I, say. Groaners. Me, I tend to like ’em—but I know they’re not everyone’s dish o’ tea. [Makes calls for a living?] for REFS. No telemarketing here, but the ABBR [Brief form of a wd.] which, in this case, is the verb referees. [One who leaves zip for a tip] for MISER. Love that internal rhyme, and while I’ve never been a [Slam participant], that does appeal to my inner-POET. [Gives out one’s address?] for ORATES (think “Gettysburg”…). [Bum wraps?] 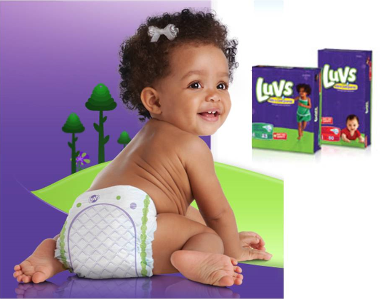 for LUVS. Luv it!! Not a lotta GRANDIOSE [Flamboyant] or long fill, but with five solid themers, certainly no complaints either about the likes of GO DEEP, UTOPIAS, BISTRO, SEA BOAT and PARADE. I’d quibble with the clues for utopias [Perfect settings?] and sea boat [Stormworthy naval vessel], however. I don’t understand why the former contains a question mark; and a sea boat is not uniquely a “naval” vessel. “Nautical,” yes, and I think that might be the better descriptor here. And with that, fellow solvers, I BID you all a fond “ADIEU” until next week! 17a. [Soccer scoring opportunity], CORNER KICK. Richard Sherman is a cornerback, I think. He’s charming but I hate his team. 24a. [Vice presidential hopeful], RUNNING MATE. Walter Payton was a fine running back. 47a. [Musical symbol], QUARTER NOTE. Quarterbacks think they’re all that. 55a. [Hold that’s illegal in amateur wrestling], FULL NELSON. Fullbacks … I don’t know what fullbacks do or who’s a famous one. I’m sure my dad taught me this back in the ’70s. Solid theme. Might’ve been nice to have either all four or none of the themers be sports clues. Half sports and half not was weird. 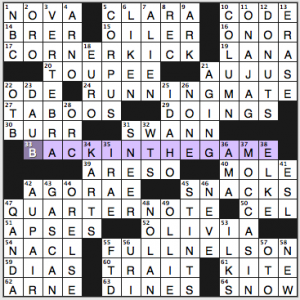 In the fill, I’m pleased to see a full MOCCASIN for a change, after those scores or hundreds of crosswords that pretend we all call ’em “mocs.” AU PAIR, VERTEBRA, and OLIVIA Newton-John are also nice (does it count as a dupe that OLLIE/Oliver Hardy crosses OLIVIA?). However, on the down side, there’s an awful lot of fill I don’t like to see in an early-week puzzle that’s meant to be relatively accessible to newbies. If you haven’t been doing a ton of crosswords already for quite some time, you might struggle with the likes of AGORAE crossing IRAE, APSES, Thomas ARNE, OTB, the ARNO River, and OTO, and if you’re a puzzle newbie and also on the younger side, ELKE Sommer may be unfamiliar as well. Hello there, everyone! 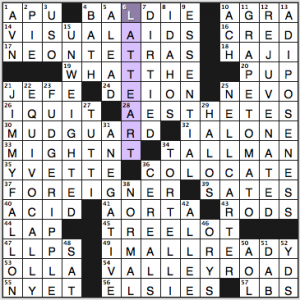 We have a crossword today which gets right to the heart of the matter, as Mr. Jeff Chen’s grid features four theme answers in which the periodic table element symbol for gold, AU, is smack dab in the middle of the entries. If you do indeed reap what you sow, then, in this grid, do you REAP (18A: [Realize, as profits]) what you SEW UP (25D: [Ice])? Sewing up this puzzle was a little trickier than expected, since I had to come to grips that GAWP is actually a word (1D: [Stare with an open mouth]). I put “gape,” then “gawk,” but I also knew that Ehilip Augustus or Khilip Augustus couldn’t be correct. So “gawp” it was. Also, initially put in “fuss” instead of MUSS, so that means I was, unintentionally, having fun with both European emperors in this grid (50D: [Tousle, as hair]). 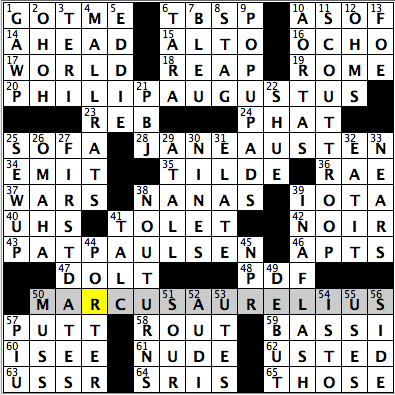 Favorite entry, along with its clue, in the grid was FIRST DATES (27D: [Engagements leading to engagements, sometimes]). Also, MALLRATS was nice fill, and it made me think of the early ’90s movie and where Ben Affleck was before he really became a Hollywood icon (4D: [Shopping center regulars]). “Sports will make you smarter” moment of the day: SHUE (22A: [“Leaving Las Vegas” actress Shue]) – A former longtime player and coach in the NBA, Gene SHUE was the third overall pick of the Philadelphia Warriors in the 1954 NBA after a standout playing career at the University of Maryland. After his 10-year NBA playing career, Shue then was a head coach in the league for 23 years, and he led the 1971 Baltimore Bullets and the 1977 Philadelphia 76ers to the NBA Finals (both teams would lose their Finals series). Shue is in the top 20 in NBA history in coaching wins (784) and in the top 10 in coaching losses (861). 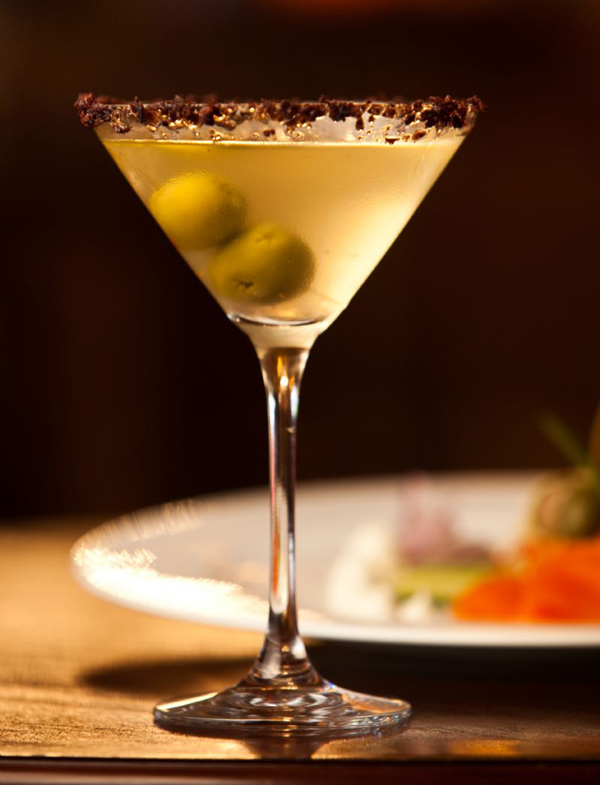 See you all on Hump Day! This entry was posted in Daily Puzzles and tagged Elizabeth C. Gorski, Jeff Chen, Matt Jones, Michael Dewey, Susan Gelfand. Bookmark the permalink. Ha, finally a crossing that any opera lover is going to love: “BEL canto” sharing its L with composer Franz LEHAR, whose “The Merry Widow” (with its memorable waltz) was just broadcast live from the Met this past Saturday (encore in movie theaters tomorrow = Wednesday evening). The chemist in me prefers “vial” over the archaic PHIAL, and would have probably clued ENE with reference to double bonds rather than as a “your guess is as good as mine” directional clue. It was fun to see “‘Evita’ role” as a double-duty clue for both CHE and EVA, although doesn’t the latter have the answer too closely related to the clue? NYT: this was a case when the revealer was needed (by me). I had no clue what the theme might be as I was solving. But I agree that the RELIEF part ties into nothing else. I’ve run a research lab for decades and have never used a PHIAL. Eppendorf tubes, now… I wish I’d bought stock. BTW, you can now buy them on Amazon —Eppendorfs that is. Although Amazon seems to sell some beauty products in PHIALs! So, may be the cluing should be updated. I took the revealer to mean comic relief, as seen in a drama or action movie. The problem is that the comics in the grid are usually the main characters, not merely the relief. Amy, why do you “hate” the Seahawks? My husband grew up in Wisconsin. That was a tough game for him. My condolences to your husband, Amy. I’m a native Cheesehead too, and have rooted for the Packers since the early 60’s. Sunday afternoon’s self-inflicted wounds were pretty hard to take. On the other hand, I’m also a UW-Madison fan, so I have a soft spot in my heart for Russell Wilson. Ditto for this transplanted Wisconsinite. Represent, Amy!